This was the first census I transcribed into Lotus Approach for analysis. [NB. 7/3/2013 - I have checked my data entry and have located a few minor mistakes although the general picture I have painted of Coates in 1861 is not seriously affected). See note on accuracy. 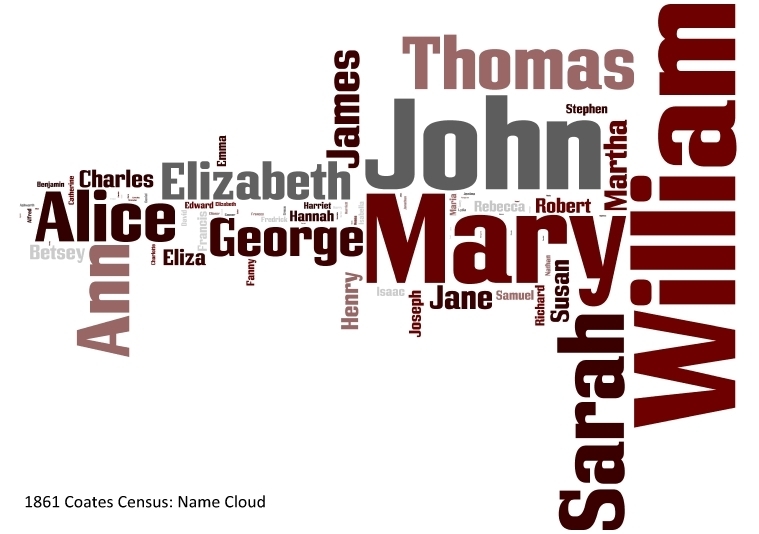 The 1861 census was taken on the night of 7th April. I started to go through the 1861 census at the end of March 2012. Doing this was an idea I had after signing up to do indexing for Family Search; it is fascinating. 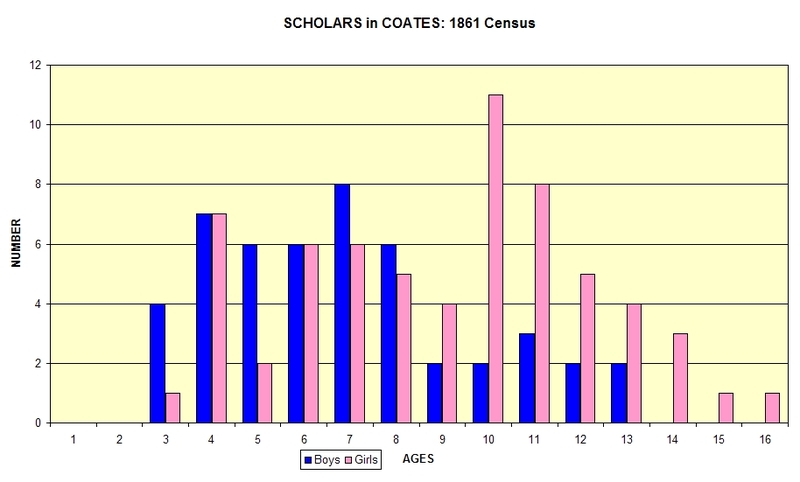 I wanted to find out what Coates was like when my Great Grandfather was born there. One 'mistake' I discovered on the census returns on Find my Past is that Oldeamere has been transcribed as Older Moor. To me it looks like Oldermeer so I will be contacting them to see if they will change it. Of course spelling was not standard donkeys years ago and it may have been known as that in 1861, mutating into Oldeamere later on. Have a look and see for yourself. If you know the history of this area please contact me via the contact page. All that part of the Parish of the United Parishes of Saint Mary and Saint Andrew's Whittlesey, bounded on the West by the last described district, on the North by Feldale Drove and the Fold on the East by the Gravel Road from Coates to Beggars Bridge and on the South by Bevill's [Leam?] to Angle Corner. This District includes Coates Oldeameer and part of Wype Doles. The whole of this District is in the Ecclesiastical District of Coates. I have placed this information on a separate page. On the right here is a cloud produced in Wordle which you can click to enlarge. A household can contain extended family, lodgers or servants and the like. This chart excludes all household members except Heads, Wives, Sons and Daughters. You may be confused by the bottom row. There are some 'schedules' on the census which consisted only of a lodger. 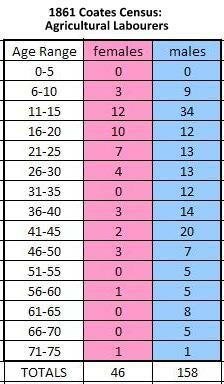 Of the 124 families with children the distribution ranges from just one boy or one girl to various numbers of each. With the life expectancy of children far from certain, large families were not unusual (I daresay contraception was not advanced either!). My own father (born in 1924) had 2 brothers and 3 sisters, although all survived. Click for a larger image of this chart. Unless stated, Coates had only one person holding each occupation listed below. There are 291 persons on the census without any entry in the occupation column. This includes 119 children aged 0 - 10 years who were not listed as Scholars or anything; 37 people aged 11 - 21; 95 aged 22 - 50 and 40 people over 50. On census night there were 7 visitors none of whom had an occupation bar one who was a scholar. Sadly, being a pauper was regarded as an occupation by the enumerator! Of the 141 woman listed a Wives, only 7 had an occupation which was listed - one presumes the other were what we in the 21st century call 'Home maker'. 1 School mistress, 1 Farmer's wife, 1 Clergyman's wife and 4 Agricultural Labourers. 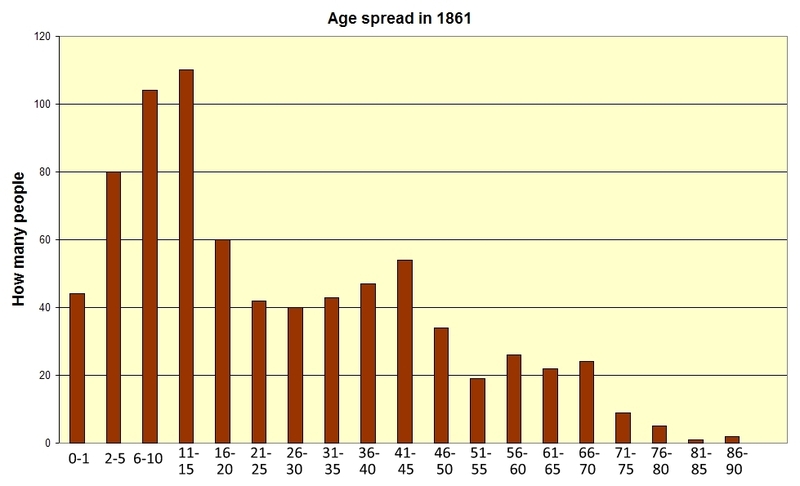 Chart showing ages of Scholars. 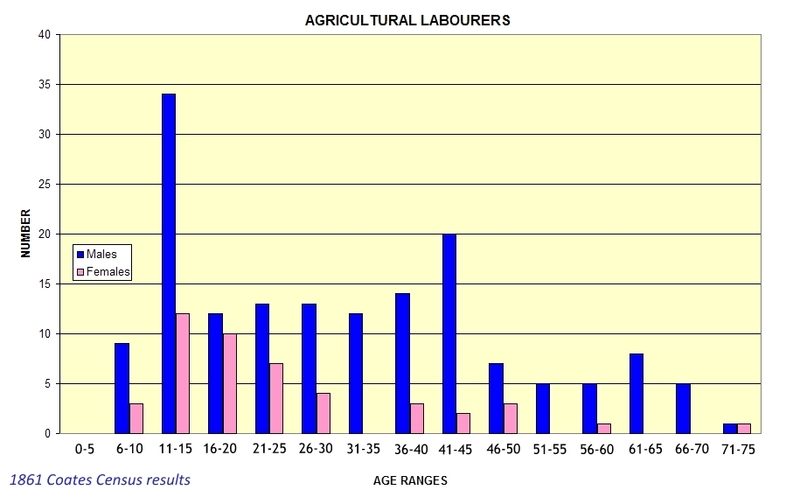 What was an Agricultural Labourer? Other information is available on the WHO DO YOU THINK YOU ARE? magazine site. Counties where people were born. Places where people were born.